Kim "Jinx" Arashikage was released in the summer of 2012 as a convention exclusive at San Diego Comic-Con. 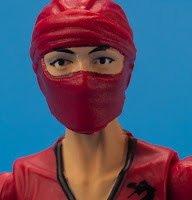 Two versions of Jinx were produced: a primary deco version matching the classic red color style of the original 1987 figure and a variant version wearing a white shinobi shozoko. The variant features the unmasked portrait of actress Elodie Yung, who portrays the character in G.I. Joe: Retaliation. Both figures were available at the Hasbro Toy Shop booth (limited to three for the primary version and one for the variant, per attendee badge) at Comic-Con and later online at HasbroToyShop.com, in limited quantities. Jinx's name embodies collector sentiment when it comes to the frustration felt in acquiring convention exclusive items from Hasbro. Many collectors feel jinxed because if you can't attend a convention or aren't incessantly checking Hasbro Top Shop after the con ends (which only has limited quantities that usually sell out within minutes), you're stuck paying aftermarket prices that are double or triple the retail cost. Did You Know? This is the first version of Jinx to provide her civilian name in the filecard. Jinx's original 1987 filecard listed "Top Secret" in the name field and several years later in the Valor vs Venom line, while Agent Jinx was revealed to be the cousin of Storm Shadow, her name remained classified and shrouded in secrecy. Kim "Jinx" Arashikage studied and competed in three forms of martial arts from the time she was seven until she graduated from Bryn Mawr. Upon arriving in Japan for a vacation, she discovered that her family had been ninjas for generations, and she was officially initiated into the clan. Jinx was recruited for the G.I. Joe team by Snake Eyes. "Don't underestimate her. She has been to the Secret Mountain and studied the Seven Silent Forms with the Blind Master. She has the Eyes That Pierce, the Iron Hand, and the Heart That Waits. She can see through your deception, batter aside your defenses and dazzle you with the strength of her will."